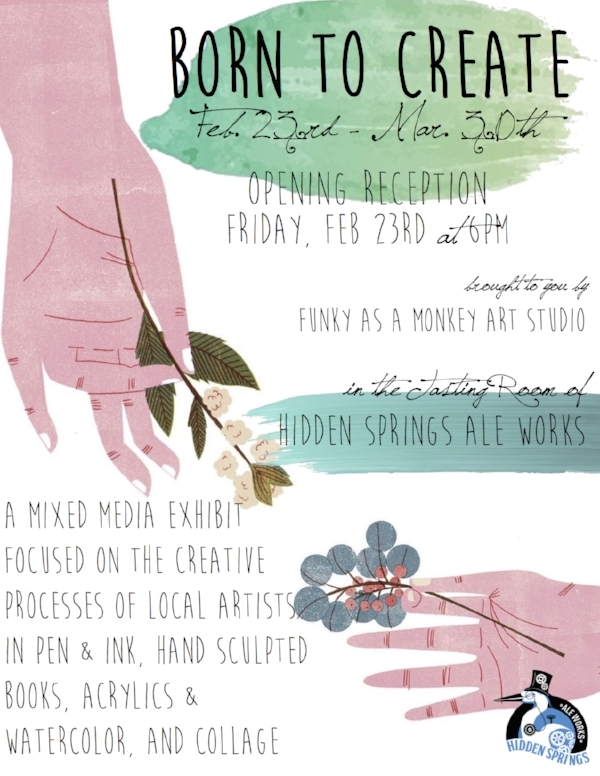 I'm so happy to announce I'll be exhibiting locally at "Born to Create" presented by Funky as a Monkey Art Studio and Hidden Springs Ale Works. You're invited to come to the opening reception on Friday February 23rd from 6pm to closing. Please see the Press Release below for more information. Tampa, Florida: Hidden Springs Ale Works presents a new exhibit, BORN TO CREATE, the art of nine talented artists who express themselves in photography, pen and ink, hand-sculpted books, acrylics, collage and watercolor. No matter the artist, all share the necessity in creating their art as stress relievers, overcoming illness, fulfilling childhood dreams and the joy of producing art through joie de vie attitudes. The nine artists are Dorothy “Dore” Anderson, whose sensational work in paint and collage, from traditional to steampunk, explode from her canvases. Dore, an experienced exhibitor and artist has curated and exhibited at the the Carrollwood Cultural Center and is a NTAL board member. Scott Brien, who creates one-of-a-kind sculpted books strives, through thrift store and garage sale finds, to “rekindle the magic that once jumped forth from the pages”. Through his book finds he discovers a message which he then illustrates through his sculpting of the actual book. L. Jackson creates photographs, oils and watercolors. His art career began at the age of eight and continues as he creates images that bring the viewer into his natural world in a magnificent array of images. Cynthia Lizardi, originally from Germany, has journeyed from stories, cartoons and acrylics to etching glass and back to acrylics. Her art portrays the power and resiliency of human life through her subliminal imagery and symbolism. Mish, a lover of nature is famous for her psychedelic gecko photographs, pet portraits and all manner of our Florida jungle-like gardens. Her bright colors and fresh interpretations provide insight into hidden garden treasures. Katra Marie Peck’s intent is to “make art that stirs the soul and connects us to the beauty of human experience, letting my paintings evolve through emotions and universal feelings.” Through Katra’s watercolors she succeeds in bringing emotion, color and joy onto her canvases through mirror-like images. Nart is a first time exhibitor and brings an element of humor and joy to the show. His images are his creative outlet as well as a stress-reliever from his corporate position. Dr. Libby Sheridan, a self-taught artist, grew up with the aroma of linseed oil as her father was also an artist. Having lived on four continents and the Hawaiian islands she gathers inspiration for her art from her travels, “but always discovers herself with her beloved oil palette back in hand at home.” Matt Sutherland’s paintings reflect his love of nature. “There is something primordial about the chaotic and structured flora and fauna that makes our state so beautiful and dangerous. I utilize nature as an allegory...reflecting my dreams, narrative stories,everyday life and random thought.” The opening reception for BORN TO CREATE is Friday, February 23, 5pm-closing All art on exhibit is available for sale. For more information, or if you are an artist interested in exhibiting your work, Contact: tim@funkyasa.monkey.com or jaynelisbeth@gmail.com. SUPPORT LOCAL ARTISTS AND OUR ARTS COMMUNITY!"